It may seem fantastical, but there is a living world deep, deep beneath our feet. Go below the soil, beyond the bedrock, and you’ll find a hot, sweaty underworld teeming with life that puts the surface biosphere to shame. Just how much life is down there has been an open question that the 1,200 scientists with the Deep Carbon Observatory have been trying to answer by probing the Earth’s crust. After a decade of probing, they now have an answer. This week, they announced that their observations had yielded enough data to estimate how much life is down there. An astounding 15 billion to 23 billion tonnes of carbon mass sits in the netherworld. That’s the equivalent of up to 385 times the carbon mass of all 7.5 billion humans on the surface, all living under intense pressure at temperatures hotter than boiling water. But worry not that the mighty biomass of the underworld will rise up and crush us surface dwellers: It’s made up of tiny microbes and eukaryotes uniquely adapted to the hellacious conditions. Rick Colwell, a scientist at Oregon State who works on the Deep Carbon Observatory’s deep life census, told Gizmodo the observatory began by trying to understand how microbes living hundreds or even thousands of meters below the surface could be used to do things like, say, clean up polluted aquifers. But the more scientists poked around, the more they realised they needed to answer basic questions about life below the surface. 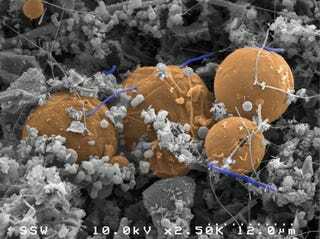 Researchers have found microbes at depths of 5 kilometres below the continents and 10.5 kilometres beneath the ocean surface, tucked in cracks in rocks that are sometimes just a few microns – thinner than a human hair – wide. Amazingly, scientists have been able to pull samples up from underground, sequence their DNA in the lab, and unravel their metabolic processes. Colwell said in some cases, microbes and bacteria have adapted to live on hydrogen and carbon dioxide and sustain themselves for hundreds of years. Other microbes have lived in stasis for millions of years and could be brought back to life in the lab. To say these suckers are resilient is almost a disservice. The new estimate of total life below the surface answers one outstanding question, but there are far more still waiting in the wings. Colwell pointed to understanding what scientists call “microbial dark matter.” Similar to cosmic dark matter, which can be detected only via its gravity, there are mystery microbes that Deep Carbon Observatory scientists can observe via DNA sequencing but cannot recreate in the lab. That means scientists will continue to plunge drills, sensors, and sampling equipment deep into the Earth to understand its mysteries. In the process, they will learn even more about this hunk of rock we live on. Heck, it may even provide us some life lessons.